I can’t stop with the Monkey socks. I seriously cannot. They keep my attention so well but are totally mindless. I can knit them in the dark and with my eyes closed. Love the Monkeys. Lorna’s Laces Shepherd sock in colorway Childsplay. It ended up being a great pattern for this particular yarn since it wanted to pool so badly with other patterns. I have the Bug hard at work balling up my La Digitessa wollmeise yarn. Those are next on the list. And the Francies for grandpa are headed to work to be finished up. Life is good. Did I mention that Bug learned the half hitch cast on Monday evening? She has practiced it every night since. I’ll have her knitting in no time! She really gets it, she gets which direction the yarn has to go and how the needle needs to go up under the yarn for the twist. I was very impressed. Everytime I think about my favorite cast on learned from stitches, I say it in my head in a very “teenage mutant ninja turtles” way. Monday night I started another sweater for J. I had bought the yarn some time ago to experiment with some designing, but soon found out that what he wanted to design and the yarn I had picked certainly did not go together. So the yarn sat in stash for a bit, until I saw Ummeyusuf’s cricket pullover. Then I started to think…upsized for a man, with the colors I had chosen for the designing, and only adding a bit of another color I already had in stash and I’d have myself a rather nice sweater for J. I patiently waited for stitches to be over with to cast on, but Monday evening had me raring to go! Plus I got to practice my TUBULAR!!! cast on. I’ve made some changes of course, I started with a 1×1 rib. I began the cable pattern when I increased for the body of the sweater. I then had to do the math so that the darkest gray line had a cable in the middle of it and work it accordingly. Those of you who know me understand that so much math was a stretch. I’d rather knit willy nilly and forget the math. But I did it, as I wanted it set up right. I am a bit concerned about what happens at the neckline, but figure I’ll worry about that when I get there. All in all I think this is great progress for 3 evenings of knitting. I am attempting to keep this one quiet but I might get too excited over it and show him ahead of time. Verdict is still out on that. She has struck again! She is quite amazing as she struck 3 people at once this time. That is a lot of wollmeise fey she has to be able to gift skeins to 3 different people. I do so love her! Her generosity is quite amazing. I think it is wonderful that she wants to share the wollmeise love. Aren’t they just so gorgeous and rich in color? My coworkers loved it, and I was amazed to see them both hold it up to their nose and smell it. Later the new coworker (whom I shall call crafty coworker from now on) came back to smell it again. And my faculty would come over and feel it and admire how the colors all blended in to one another. See? Even non yarnies aren’t immune to the love of this yarn. Included in the package was a pair of monkeys to add to my collection. They are so pretty and soft! They are made out of Lorna’s Laces in Georgetown colorway. I am currently knitting monkeys in Lorna’s Laces Childsplay and the yarn feels completely different to knit with than it feels in washed and blocked socks! They are a lot softer upon finishing. 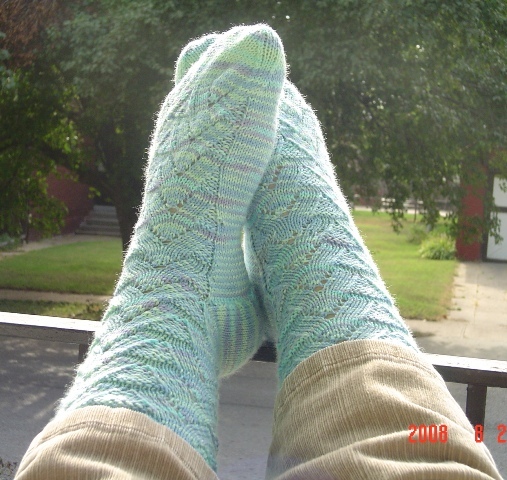 And can you believe these are one of the very first pairs of socks she ever knit? They are perfect I tell ya, not a flaw in ’em. She also sent along some nice soap and some of the fruitiest flavored dark chocolate (guess why I can’t show you that!) and a keychain mini sock blocker and patterns for a sock. So cute! Thank you wollmeise fairy for your incredibly generous spirit! 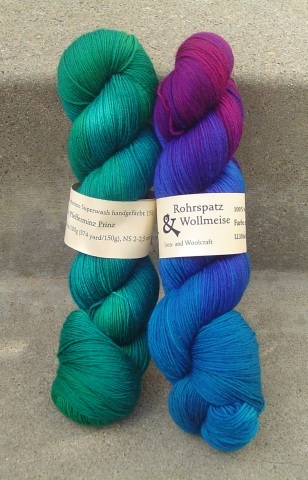 And….as a side note…I scored another skein of wollmeise in trade for my handspun! Who knew that it was worthy of wollmeise! Yes, it has been over for a couple days now, but I didn’t have the chance to post about it. I did though, want to post a wrap up featuring the beautiful work of my dear teammates, since you have already seen the February Lady Sweater of my own. Let’s start with Phyllis, who completed a lace shawl and a hat during the ravelympics. 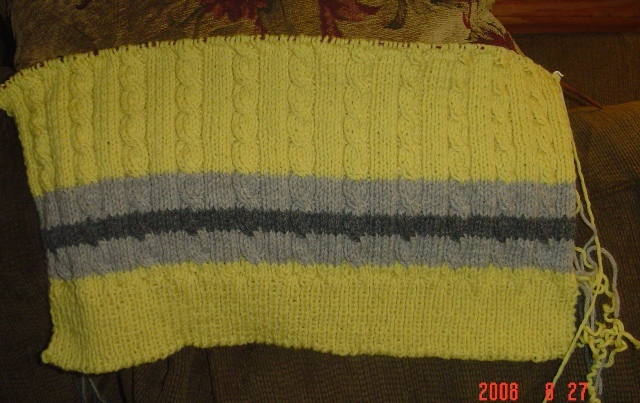 (The hat featured completely reversible cables, how cook is that? Next up Sarah with her scarf that I am sure she thought would never end. Turned out beautifully, great stitch definition, the cables and lace combination is stunning! Savasana made some already well loved socks for her sister, and they are fantastic! I think the matching heels, toes, and ribbing is just the cutest thing! And Ummeyusuf really cleaned up despite a computer disaster. Her knit and crochet yoke sweater is done though I hear she is still WIP wrestling despite the ravelympics being done. I wish her luck as I know that this time of year is busy for her! So there you have it! That draws us to the close of 17 days of intense knitting and project completing. Thank you to my teammates for allowing me to use their pictures and links for my blog. First off, I was a bit nervous about driving my car to Chicago. It is getting up there in years and though I think it is quite reliable, you just never know. I did, on my moms advice, get triple A just in case. Also, it has been awhile since I have driven near a city (excepting on the trip with my parents recently, and that did go swimmingly, but then again I didn’t have to do it for a long period of time.) The drive was overall quite easy. I had no trouble following my directions and my inner secret city driver kicked in just fine in the traffic heavy areas. I did miss one turn in Schaumburg itself but was easily able to figure out an alternate route to the hotel. Walking into the hotel was quite amazing. I had called Kathy to have her meet me and take me up to the room to get settled in. I showed up between class times luckily. The hotel had an entire floor that was just beautiful lobby area with loads of seating for relaxing and knitting. It was bright as one side was entirely glass, and as you looked up you could see all the floors above you. There were fountains and fireplaces, creating a relaxing and inviting atmosphere. We had a room with 2 double beds, and the bathroom had a TV in the mirror! I was somewhat weirded out by that, but it was rather impressive. The reason the TV in the bathroom was disturbing was that it turned on when both the lights went on, therefor you would be in the bathroom, doing whatever it was which you needed to do, and suddenly there is a voice talking in the room with you. Impressive, perhaps, but very strange. I had a short class on Friday, so I wandered about the marketplace for awhile. Completely overwhelming, I cannot even begin to describe. Aisle after aisle of booths dedicated to yarns and fiber arts. I couldn’t focus at all! I couldn’t find what I wanted and just kept walking about, not purchasing anything on my list because I couldn’t get focused enough to do so. I went to my class (creative cast-on’s) and learned a lot. Namely that I am unlikely to ever use a picot cast on as it looks….like fingers dropping off the bottom of the cast on edge. I also learned a 2 color cast on and a tubular cast on, both of which I will use, and have already used. Next sweater will get a tubular cast on and it is called for in the scarf I intend to knit for Nick next as well. I then walked about the marketplace some more, picked up some natural camel colored alpaca for a coraline sweater. I think the drape and the softness will work very nicely, and the smocked yoke will show up perfectly. I also grabbed up some silk hankies to spin. My purchasing rules for spinning were that it had to be something I have not done before, and silk hankies I have been wanting to try for a long time. Then I was more than done with the market, as I still couldn’t focus though I was blaming it on the long drive. (Those that know me will realize this was just an excuse.) Oh, I did also pick up some wool/silk for a tangled yoke cardigan. It is in the most lovely smoky dark blue color. And shiny due to the silk! Friday evening was the fashion show and dinner which I had declined to go to. I let the girls be on their way while I made plans to have some Indian food. You see, I was smart and asked some people here what were their favorite places to go eat in Schaumburg. My idea was to try not to eat any chain or american style cuisine as when in Chicago, one should take advantage of the good food. So I wandered off the a lovely little Indian restaurant all by myself. I took a book. The servers were very nice to me (probably in the “look at this poor young woman all alone” way) and left me to my food and my book. So it turned into a very enjoyable evening for me! I headed back to the room afterwards and waited upon the return of the fashion show gals, then we headed downstairs to the seating areas to knit and enjoy a glass of wine. Saturday was a day which both Sarah and I had free. Kathy and Corrie had classes all day. Sarah agreed to come help me in the market, as she seemed to know her way around better and be more focused. She was indeed very good at keeping me focused. She was able to see things which I would like and draw my attention to them while I could not see them in the first place. She was also good about “We will come back to that later, once you have seen everything.” Which does help in the spending department. Our first stop was at the stand that was selling blue moon fiber arts socks that rock. Fabulous yarn, and I never buy it since shipping tends to be pricey. I had thought to buy another sheep to shoe kit as I was so thrilled with the first but ended up getting sock yarn and locks to spin instead. Oh, and some silk laceweight in one of the raven colorways as well. Sarah was also able to focus me enough to see the Habu Textiles booth. In this booth I fell in love. I kept going back over and over to look at the colors and the fibers all packaged up so neatly. I couldn’t stop! I cannot even begin to describe the wonderfulness of this booth! I ended up purchasing some bamboo laceweight, for a very inexpensive price and I managed to leave the other stuff alone. Mostly because I couldn’t decide on anything. There was silk/mohair blend that would make lovely scarves, and hand reeled silk from the cocoons and handspun and dyed, purchased in Laos. I wanted that more than anything else but refrained (for now). Even more amazing were the various textiles like paper, or stainless steel, which were turned into yarn! I found this booth so fascinating I just couldn’t stay away. I found a booth selling Irish yarn, they had tons of sweaters in cabled patterns done up as samples. The wool was scratchy but had some of the nicest cable definition I have ever seen. This yarn would prevent the great Starmore aran felting disaster of 2007. And also you can see our obsession with blue moon fiber arts, this is the haul of 4 girls at the blue moon fiber arts booth. What amazes me is that we tended to pick similar colors even when we shopped separately. I had gotten the recommendation of a small Pakistani restaurant in the area. I was warned that it was very casual but told that I would like it. Since Sarah and I were both free to wander, I asked if she was feeling adventurous enough to go too. Given that my friends have a love of adventure, she was more than willing to give it a try so off we went. We came upon a small restaurant which did not look like it was used by many Caucasian american born people. (all the better since the food is probably not “watered down”, I hate that, I love the spice!) We were having a bit of a late lunch but there were still quite a few people there. We were both quickly overwhelmed by choices so decided on the buffet. I cannot tell you exactly what we were eating, but there was goat curry, one of my favorites, and it was wonderful! Sarah laughed at me eating the meat while she was enjoying her vegetarian choices more than the meat based dishes. Now, I worried that Sarah was just being polite when she told me she loved the food, but when she went back and told the girls that she liked it, AND called her husband to tell him she liked it, I started to feel confident that she actually did like it. He told us we made his night. I agree, We were fun! LOL. The evening probably couldn’t have gotten much better. In the picture, from left to right, Kathy, Sarah, Corrie, and myself. As do all things, even the weekend had to come to an end, though we attempted to prolong it as long as possible. Corrie and Sarah were flying out early Sunday morning and Kathy was headed out too. I had a class at 1:30 PM so I was not leaving Chicago until 4:30. After the gals left, I wandered slowly through my morning routine, and did some knitting and packing. Checked out and headed to the market for lunch and to see who won the grand prize (not me.) then off to my steeking class. Steeking class was fantastic! We learned a bunch of different ways to steek as well as many different ways of finishing off a project. I am not nervous about them anymore in the least, as I now know that I can do it and that the yarn won’t make a mess. I thought that 3 hours would be very long, but it was not, I was entertained and engaged the entire time. And then I headed home. Around Des Moines, after 5 hours of driving, I started having trouble. Knowing I had another 2.5 hours of driving ahead of me, I began to be concerned I would not make it home. I had been up since 4 AM with no nap so it isn’t surprising that I was nodding off. Actually, I thought I was fine but would realize that the car (which does not have cruise control) would be going slower and slower. I would speed back up and then the same thing would happen. I began to think I’d be better off stopping for the night and driving the rest of the way in the morning, so for safety’s sake, that is what I did. What I will do different next year: As this was my first year, I didn’t know that the classes would be that great! I saw what my companions were doing and I was jealous! I just didn’t know that I would learn that much. It is hard for me to spend money on classes when I could probably figure it out for myself. But as I have never taken lessons before, I was amazed at the ease of picking things up when someone was showing me and teaching me. Additionally, taking a class might cause me to think out of the box about something. They might have a tip or a trick that I didn’t think of or come across, that makes life easier. And I am sure that I might look at some knitting techniques and never take the time to figure them out unless I was in a class dedicated to that technique. So next year, I am spending my money on the classes! I will also attempt to be there for more of it, have my vacation dedicated to it, because it is SOOOO worth it to me! Socks! All socks all the time. I had finished one of grandpa’s francies before I left and started on the other. I then finished one of the monkey’s and started on the second one. I then had a breakthrough with the dreaded pomatamus socks, and managed to finish one as well and start the next. Take a look! Thank you for bearing with me (if you managed to read to the end) through my fantastic weekend of yarny amazement! Up next…more yarn fairy goodness and a final ravelympics post. There WILL be a large update on the blog tonight including pictures from stitches. Soon. I sewed. Yep, I sewed my swatch for my steeking class. I stressed over it, but took my mothers advice of using tissue paper over the stitches. After an initial tension issue, I managed to sew it just fine with very pleasingly straight lines. So it leaves me a bit of tissue paper on the edges, doesn’t matter, it is a swatch. It served its purpose and I won’t be as scared again. Which means I am all ready for stitches midwest now!